Combine powerful performance and wireless connectivity with the white 32GB Galaxy Tab S2 9.7" Wi-Fi Tablet from Samsung. This tablet features a Qualcomm octa-core chipset, which consists of 1.8 GHz and 1.2 GHz quad-core processors, and has 3GB of RAM. This system also has 32GB of built-in storage and adds a microSD slot for additional storage; the microSD slot supports microSDXC cards up to 128GB. For high-speed Internet connectivity, dual-band 802.11a/b/g/n/ac Wi-Fi with MIMO technology is built-in. Bluetooth 4.1 connectivity is also integrated for pairing with other Bluetooth-enabled devices. 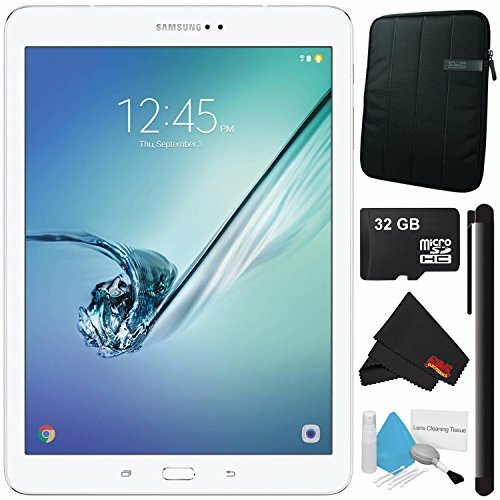 This Samsung Galaxy Tab S2 features a 9.7" Super AMOLED touchscreen display with a QXGA 2048 x 1536 native resolution for viewing detailed high-definition content. The onboard front facing 2.1-megapixel fixed focus and rear 8-megapixel autofocus cameras allow you take pictures of yourself and the world around you. There's also a fingerprint reader on the tablet, which allows you to secure the device with the swipe of a finger.